Last year, we predicted that 2018 would be the year of home efficiency. We weren’t disappointed in this prediction. By the middle of the year, Business Insider reported that Americans had chosen solar energy over all other types of electricity, so far. And earlier this year, we presented some initial remodeling trends to watch for, including wood soffits and exterior walls, commercial-style windows, and LVT flooring. Building on those early predictions, we think 2019 will be the year when homes gain a few IQ points in the tech world. Despite many reports in the media touting the opposite, the fact is that the internet generation is currently buying more homes than anyone else. And, they’re not just purchasing starter homes. Many are purchasing their high-end dream homes — or building them — and convincing their parents to adopt newer technology. This will naturally affect remodeling trends in 2019. So, before you finalize your home remodeling plans for the new year, here are some 2019 home remodeling trends you should look out for. According to Forbes, millennials are more likely to be the ones choosing DIYing projects, but they’re not alone. Last year, almost 25 percent of Americans tackled home improvement projects. Yet, only 7 percent hired professionals. While this does save money in the short run, the same article reported that over a third of homeowners who completed home improvement projects felt they should have allocated more funds towards it. So, if you’re purchasing a home this year, be sure to ask whether or not the improvements you notice are under warranty. This will let you know if they were completed by licensed professionals. No Handles: Many homeowners are choosing not to put handles on their cupboards and drawers, opting instead for press-release upgrades. Light Pastel Colors: From fashion to home improvement, powdery pastels are making a comeback, and the kitchen is no exception. More Metal: Stainless steel has become a staple in the kitchen, but metal is now being increasingly incorporated as an accent for light fixtures, bar stools and faucets. Indoor Sauna: Why pay to use a spa’s sauna when you can install one right at home? This seems to be the thought behind sauna additions in at-home bathrooms. Concrete Structures: Like the incorporation of metal in the kitchen, using concrete in the bathroom creates a more tech-inspired, industrial look. Glass Showers: Standing showers with glass doors, or made almost entirely of glass, are now becoming more popular. They are usually accompanied by spa-inspired shower jets. Accessory Dwelling Units: Owing in part to the popularity of Airbnb short-term rentals, homeowners across the country are converting garages, building guest suites in the backyard and finally finishing that basement. Home Office: Around the world, for at least one day each week, 70 percent of people work from home. Also, as of 2018, freelancers accounted for more than one in three workers. This makes it extremely important to have a quiet space at home to be productive. Relaxation Areas: With more work taking place at home, separate spaces for relaxation will become more popular. This might explain the spa-like bathrooms and indoor saunas! It will also lead to more sunrooms, decks, reading rooms and true master suites. Low-Slung Seating: With the growth of minimalist modern designs, low-slung seating will only become more popular. Hammock Chairs: Hammocks made a serious comeback in 2018, but the styles have changed. Some now hang from your overhead deck, feature back support and include the comfiest cushions. Mixed Materials: Can’t decide whether you should stick to wood, stone or metal for your outdoor design? Use them all. Mixed materials have become increasingly popular for contemporary indoor designs and have begun to make their way outdoors. Smart Lock: Smart locks on homes became popular as more and more Airbnb homeowners used the feature to make check-in easier for their guests in their ADUs. However, they are now becoming more common on front doors of the main house. Sensor Lights: Sensor outdoor lights are fairly common. Smart bulbs are now bringing this technology inside. Essentially, lights will turn on and off in a room when you enter and exit, and can simulate this when you are away to trick would-be thieves into thinking you are at home. Smart Thermostat: Now, you’ll never have to cross the room to fiddle with the thermostat. Just tell Google or Alexa what temperature you like and let technology take care of it. Home Surveillance: Home surveillance is becoming more and more popular in America, especially with easy DIY kits that can be purchased from Amazon, Google and Samsung. Many people use the cameras not just for security but also to keep an eye on pets and children, communicate with family members or even instruct the mailman on where to leave their packages. 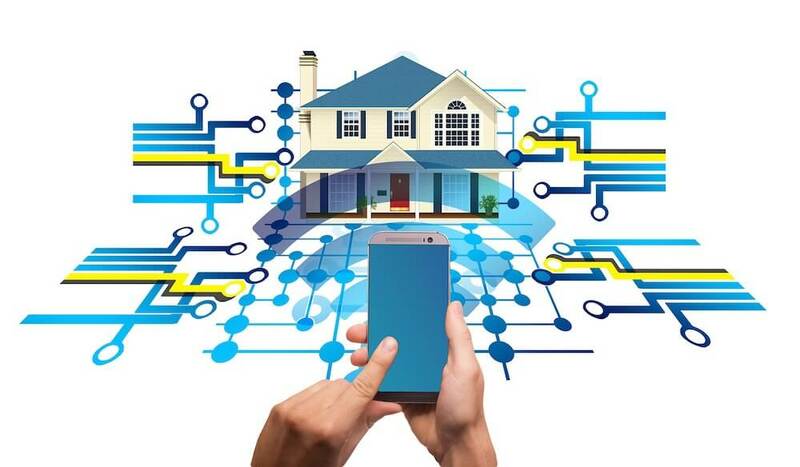 For 2019, homeowners of all ages will be adopting smart-home features to increase the safety, convenience and efficiency of their homes. Paired with light pastels colors, industrial-styled metal fixings, clean lines and spa-like bathroom designs, contemporary and industrial-styled designs will continue to dominate interior and exterior designs.